George can feel the earthquake coming. It’s going to change his island forever unless someone is prepared to defend it from the onslaught of ugly words, weird fruit and antisocial spiders. George is prepared. He’s finally woken up and smelled the soup and now he’s ready to defend his castle. A darkly comic and poignant play by David Stephens. “Writer and performer David Stephens has a good face for character comedy, and an ear for bathos. 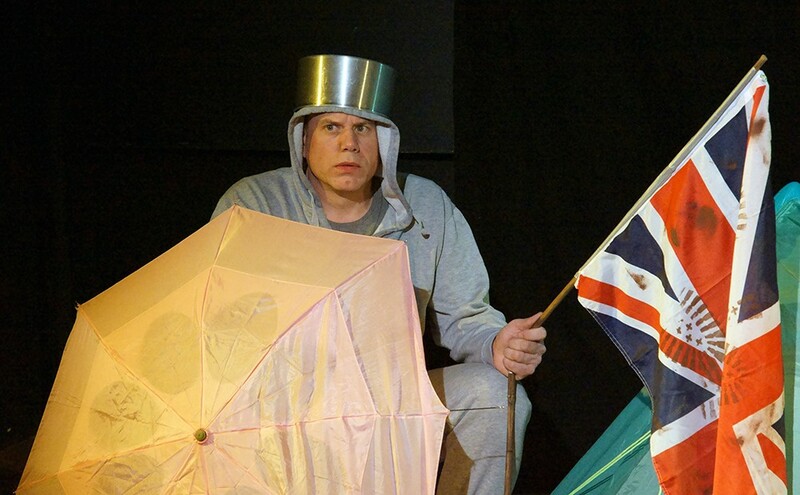 Emerging from behind his tent with a saucepan on his head, George is like Tweedledum in a tracksuit, forever gearing up fretfully for an elusive battle. But the writing reaches around the easily dismissed stereotype. Behind George’s snarling defender is an elegiac poet who wonders how we will explain the beauty of galaxies now that ‘epic’ and ‘awesome’ are applied to nights down the pub. “You must not miss this!” Phizzie. “A funny, moving, and captivating show. I recommend this to everyone, wholeheartedly” Anon, Arundel.